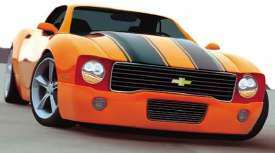 Edmunds Inside Line is reporting that Chevrolet and Dodge are headed for an RWD concept-car showdown at the 2006 Detroit Auto Show, with Chevy unveiling a new Camaro prototype and Dodge introducing a two-door Challenger concept. Both companies, it's said, are evaluating potential entries to compete with Ford's new Mustang — though any new model from either company likely won't likely appear before 2008 for Dodge, and 2009 for Chevrolet. The Camaro concept, unfortunately, won't likely get any cues from California artist Kris Horton's Camaro concept (pictured).